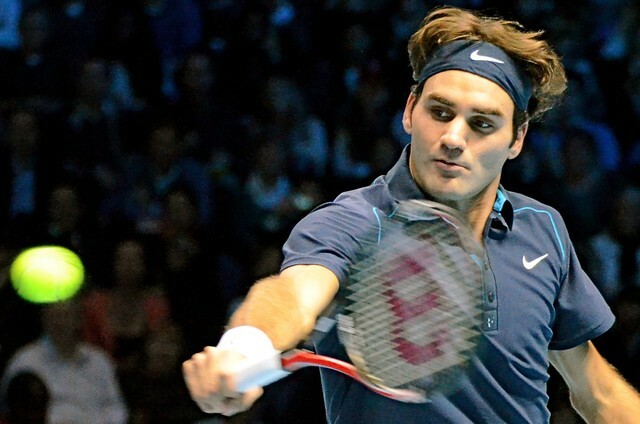 ROGER FEDERER has won the Barclays ATP World Tour Finals at the O2 arena in Greenwich. 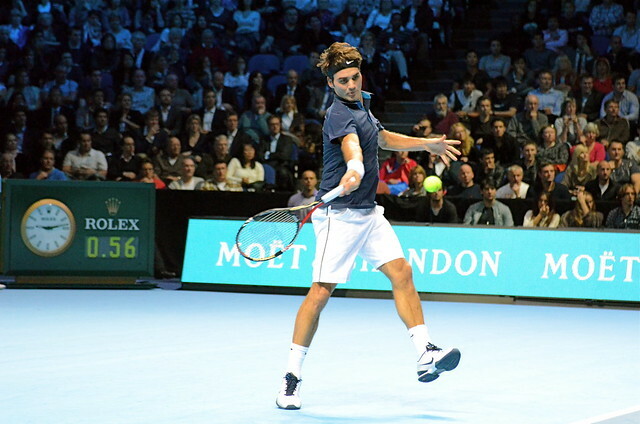 Federer beat Jo-Wilfried Tsonga 6-3 6-7 6-3 before a capacity crowd at the north Greenwich venue. Playing in his 100th tournament final, Federer’s thrilling victory gave him the end-of-year championships for a record breaking sixth time. By mid-way through the second set, Federer looked all set to wrap it up in two but the Frenchman battled back to take the set and give the fans a final, third set after a nerve-wracking tiebreaker. Tardy spectators including London’s mayor, Boris Johnson, were booed as the umpire had to hurry them to find a seat as play was held up after a change-of-end break during the third set. 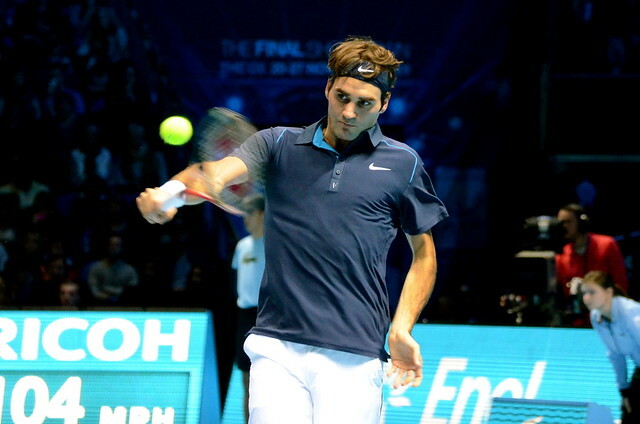 Federer added: “I don’t think this tournament could be any better run. We’ve had a wonderful time...I really enjoyed every minute of being here.... See you next year, hopefully." 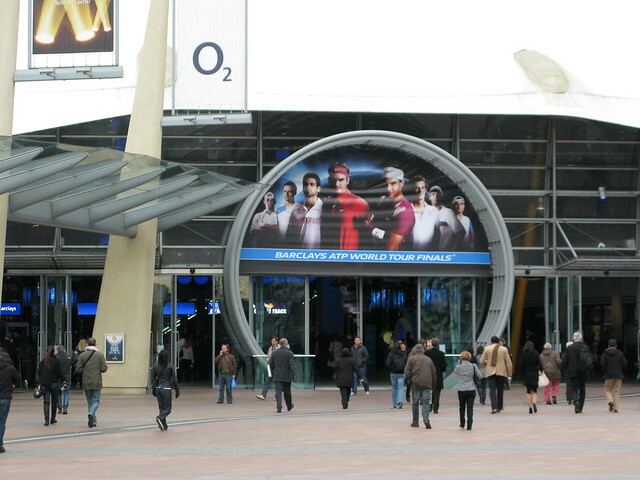 The ATP World Tour Finals return to the O2 in November 2012. 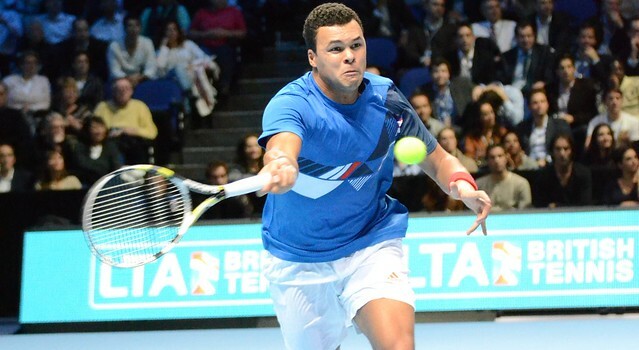 Jo-Wilfriend Tsonga from his match against Rafael Nadal at the O2 last night. "The atmosphere's spectacular... This is in the perfect place. I think that the tennis fans here are very respectful. They love who they love. They love their stars. But they're very respectful of good tennis. I can appreciate that." 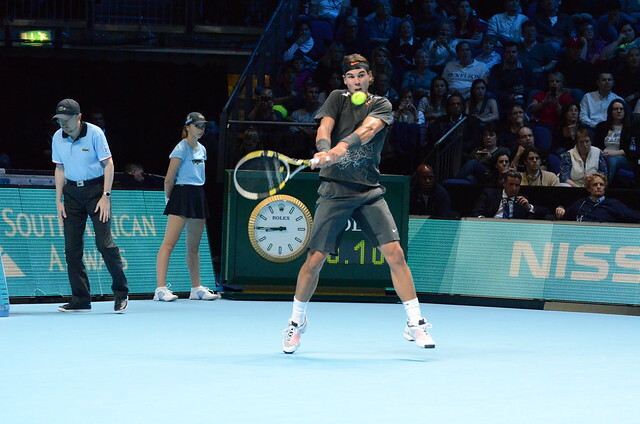 Former world number one, Roger Federer, put on a masterclass display before tennis fans at the ATP World Tour Finals last night. Federer swept long time rival Rafael Nadal aside 6-3 6-0 in ruthless style to continue his 100% record against the Spaniard on indoor surfaces. What was expected to be one of the tightest matches of the end of season championship became a tour de force for the Swiss maestro, dispatching his opponent in just one hour and giving the O2 it's earliest finish since the tournament began on Sunday. Nadal, who suffered a bout of sickness in his previous match, is not out yet though and will play his last group match against Jo-Wilfried Tsonga on Thursday evening. Earlier in the day it was announced that home-favourite Andy Murray was pulling out of the tournament after suffering a groin strain. His place will be taken by Janko Tipsarevic of Serbia who plays his first match later today, against Tomas Berdych. 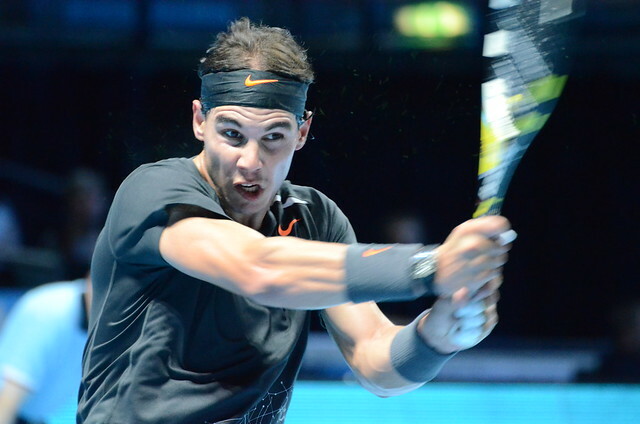 RAFAEL NADAL clinched the win in a late night thriller on the first day of the Barclays ATP World Tour Finals. 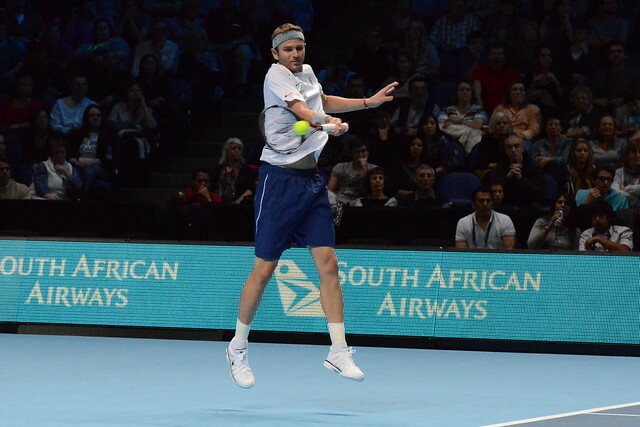 The World No 2 beat Mardy Fish 6-2 3-6 7-6, with the tie break not ending til about half past eleven. Earlier in the match, the Spaniard had to leave the court due to sickness. "I feel not very well now... I really need to come back to hotel and rest a little bit because I played for one hour suffering a lot," he said after the match. Earlier in the day, Roger Federer beat the charismatic Frenchman, Jo-Wilfried Tsonga, avenging his Quarter Final defeat at Wimbledon this year. Organisers reported a full capacity for both the afternoon session and the evening session. 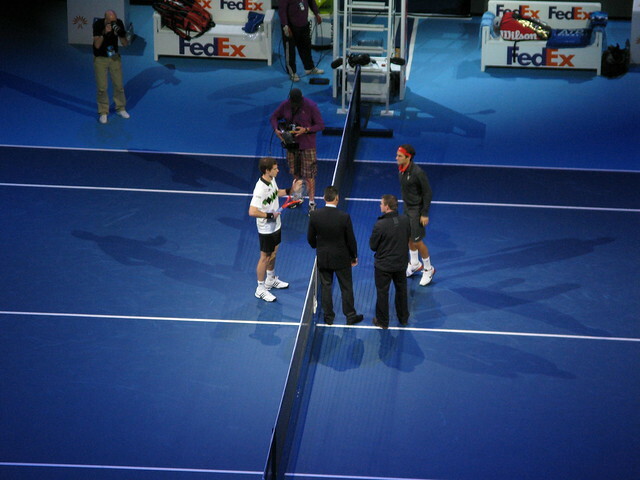 British No 1 Andy Murray takes to the court this afternoon as he goes head to head with David Ferrer. 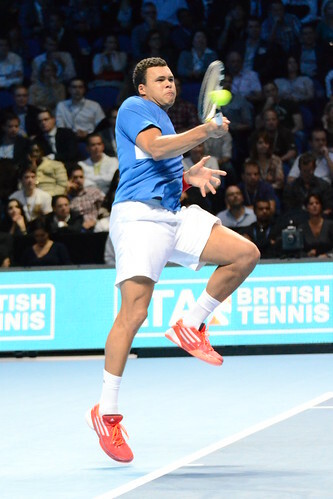 The Barclays ATP World Tour Finals get under way at The O2 arena on Sunday. 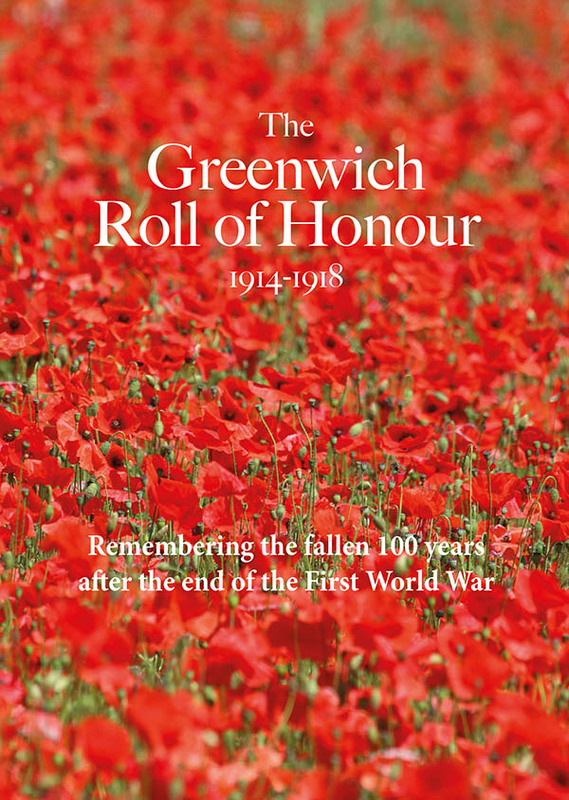 The end-of-year spectacular, now in its third year at the North Greenwich venue, sees the top eight male players of 2011 go up against each other. Andy Murray joins world number one, Novak Djokovic, in Group A along with David Ferrer and Thomas Berdych. 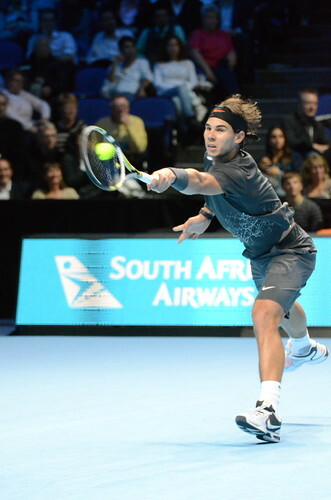 Rafel Nadal, Roger Federer, Jo-Wilfried Tsonga and Mardy Fish make up Group B. Players go head to head against the other members of their group, with the group-winners and runners-up advancing to the semi finals. The tournament last throughout the week, with doubles matches daily too, and will conclude next Sunday. Andy Murray will play world number one, Rafael Nadal, at the Barclays ATP World Tour Finals at the O2 arena in North Greenwich this afternoon. Nadal secured top position in Group A after beating Wimbledon finalist, Tomas Berdych, in an impressive straight sets win yesterday afternoon. Murray and Nadal have already met three times this year with the Scot winning two of those encounters - notably both times they played on a hard surface. The second semi final will take place tonight between Group B winner, Roger Federer, and Group A runner-up, Novak Djokovic. 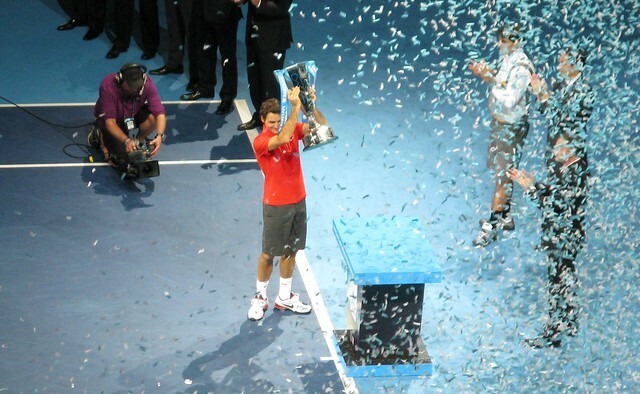 The winners of the semi finals will play on Sunday, when the Barclays ATP World Tour Finals 2010 Champion will be crowned. It was day three of the ATP World Tour Finals at the O2 today and I went along to see Andy Murray go up against Roger Federer. Notionally, Andy Murray was the home favourite but I'm pretty sure that it was Roger who got the loudest cheers from the near capacity crowd. Spectators, myself included, who expected a close match following Murray's defeat of Federer at last month's Shanghai Masters were left disappointed by a pretty one sided match, with the Swiss Maestro winning 6-4 6-2. If you haven't been to see the tennis at the O2 yet, it has a great atmosphere - players entering the arena to the sound of "London Calling" by the Clash and the heart thumping sound effect culminating in a chorus of "ooohs" as 'Hawkeye' decisions are revealed on the big screens both add to the excitement. The tournament ends this Sunday so there's still time to get yourself a ticket - and even non ticket holders can go and check out the "Fan Zone" at the end of the O2's Entertainment Avenue which includes the players' practice courts.